Absolutely Gorgeous! Bright colors, soft. I have had it for a few months now and it is holding up great! Great Quality for the price. I ordered matching pieces and they all matched and looked great. 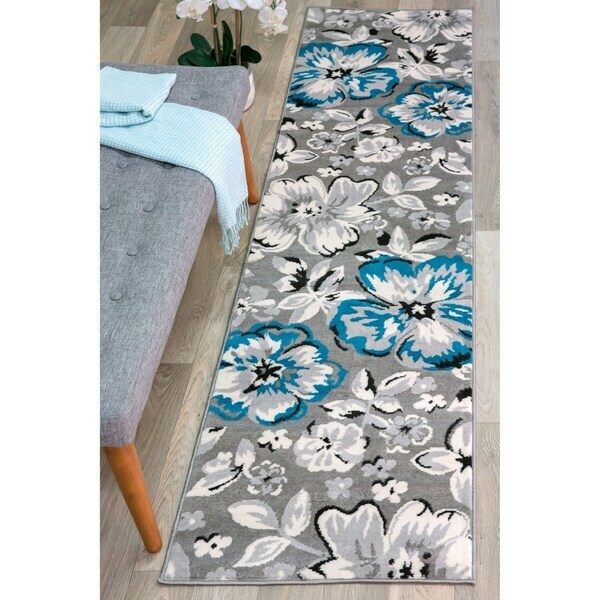 Add color and drama to a drab room with the fresh display of this modern area rug. Machine made from polypropylene for durability and comfort, this transitional rug features a gorgeous floral pattern in an unexpected and brilliant pairing of blue, yellow and beige tones. Perfect for adding just the right pop of color to your room, this rug is stain resistant. This jute backed rug requires the use of a rug pad to extend the life of the rug and prevent shifting. Dimensions 87.0 In. X 24.0 In. X 0.29 In. I Love this Rug!!! I got it for my front hall but liked it so much I couldn't decide which place in my house I wanted to put it. I Stuck to my guns and put it in the hall but may get another one for my bedroom. The Pop of blue is gorgeous!!! Very nice rug, a little bit on the thin side but nothing a rug pad won't fix. I bought the ruuner fir hallway because I nrought the area rug looked great in her room. The color & pattern is very pretty. Arrived quickly after ordering. Great print and color. purchased to match our entry way 5x7 rug and living room 'cream and yellow' version. Very happy with our purchases. Very nice rug! Makes my family room look beautiful! Runner was to thin and colors were darker than photo. Wanted to return item but their shipping return label would cost me more than I purchased the runner for. Will not be purchasing anything from Overstock again.